Britishers have left for us many a things which still revolves around the time and life of Indian’s , whether that be Toy Train of Ooty , Shimla or Darjeeling , Tram of Kolkata or the Hand Pulled Rickshaws of Kolkata. 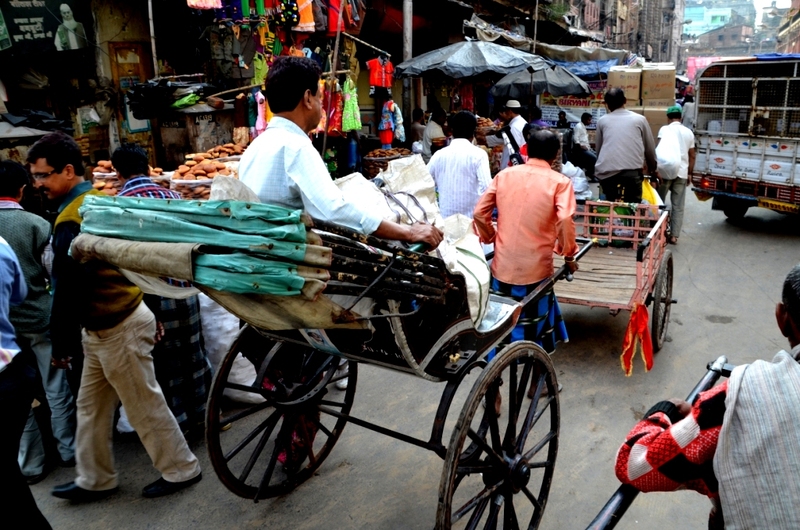 Hand Pulled Rickshaw are from that gone era which has lost its impression in India , but which could be still felt in the air of Kolkata. It was 1880 when Hand Pulled Rikshaw were brought to India for first time in Shimla and later on entered Kolkata as well and is still present , though from all over world it is fast moving towards extinction. 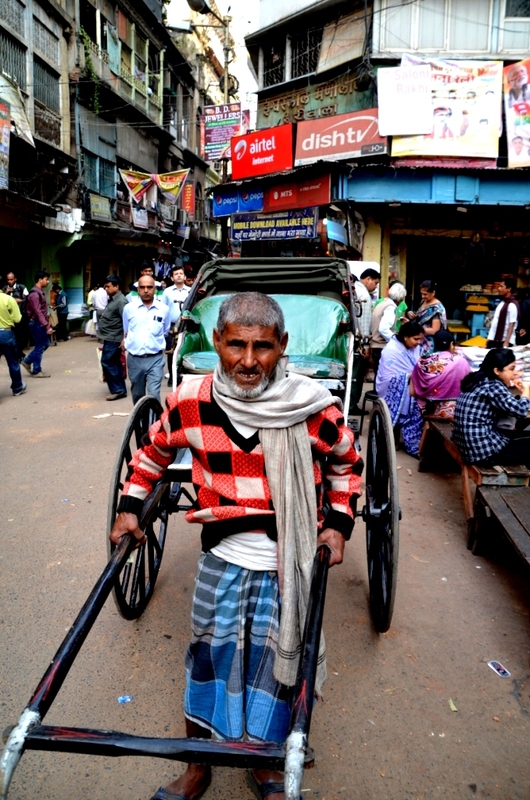 In Kolkata there are some 18000 Hand Pulled Rickshaw’s , some licenced by the government and some not. Many activists have started raising their voice to remove these Rickshaws on the humanitarian grounds , but the Rickshaw pullers are adamant and have struck to it and are not even convinced about the rehabilitation schemes given by the government. 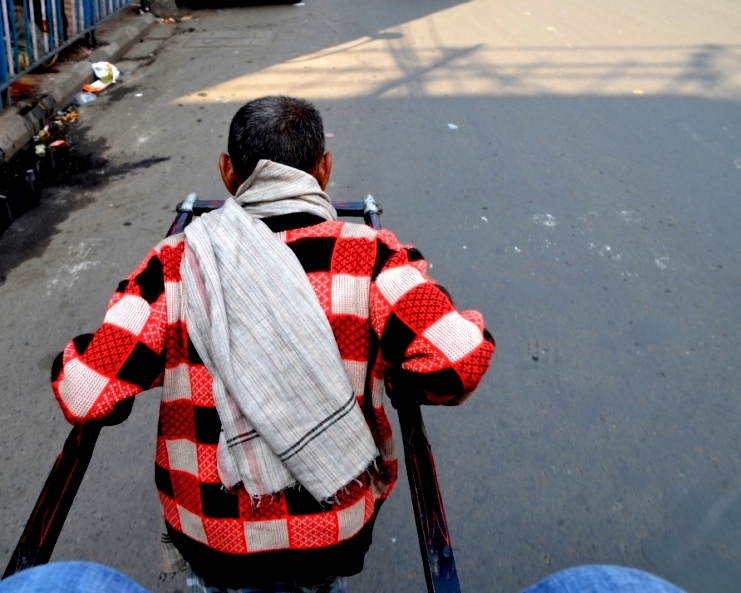 Mostly found only in North Kolkata , these Hand Pulled Rickshaw could be seen going on the roads either carrying some luggage , school childrens or a person , but mostly these run for only a small distance. We met this old man just in front of our hotel and asked him to take us to Burra Bazaar, my first destination in Kolkata. In a very high pitch he said ” 100 Rupiah lagega ( It will cost Rs 100 ) “ , i knew he is asking too much after seeing a big camera in my hand he has realised that i am a tourist , and i also had realised that how much he is going to lift on his back , me and wife would atleast weigh around 150 Kg ( you can laugh my readers ). So i said yes and boarded his rickshaw , though was bit scared whether he would take us safely or not. Looking down towards the road , he kept on moving giving us a bit of jumping feelings without any speed breakers. I kept on praying , wish his grip doesn’t slip , i don’t want to see myself on road in front of Kolkata people. Worst time of my ride came when we had just entered Burra Bazaar and one more Rickshaw came from behind , and our old man got excited and started talking in bengali to him , i could understand that he wanted him to go first and the other guy was adamant and he kept on running fast. What to expect , our old man also changed his gear and started running fast in a zig zag style and i kept on shouting from back ” Baba Dheere Chalo Baba Dheere ( Slow down please ) “ , but he was not in a mood to listen and atlast won, wow. Atlast our 15 minute ride came to end at Burra Bazaar. But i was not over with that old man, i started asking him some questions , knowing about him and his life. He told us that he belongs to Bangladesh , though he moved here when he was a kid and Bangladesh was in India only. ” Bas yahi rickshaw hai jo ham jante hain beta , logon ko safar karate hain yahi hamari zindagi hai ( Only rikshaw is what we know in life, giving ride to people is what life is all about of us ) “. Very proudly he even told us , ” Babu ham log bimari ki bhi jankari dete hain logon ko ( we inform people about the diseases also) ” , by this he meant to say , that these rickshaw pullers have access to red light area of Kolkata , and government has given them this responsibility to make people aware about HIV and AIDS , to whoever they leave to red light area. But truely after this ride, i was also on the same point ” These Rickshaws should be stopped , if government provides them an honourable life and good remunerations , then they also should agree ” , truely being a human it was tough for me to ride on humans back , but this is what life is, sometimes we have to do which we don’t want to do. But all this done for you readers.